Whether you are visiting Tahoe for the incredible outdoor fun or simply to get cozy by the fireplace and watch the snowflakes fall, the 'Aspen Brook' Cabin is what Tahoe is all about!! Situated in a remarkable private setting surrounded by a wraparound deck, whispering Aspen trees, a babbling brook and a big green lawn, the Aspen Brook Cabin was built by famous Lake Tahoe architect Burt Anderson in the Old Tahoe Style. Despite this rich Tahoe heritage, it offers a host of modern conveniences including broadband/WI-FI access, surround sound audio system, heated floors, new slate-tiled bathrooms and new kitchen with stainless steel appliances. 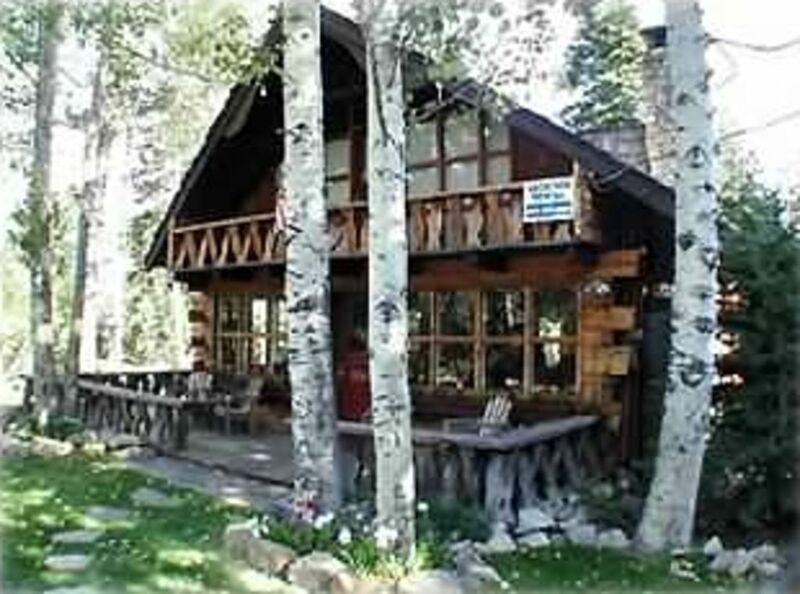 The cabin is meticulously maintained and decorated with true Tahoe charm for your enjoyment. Outside, the wrap-around deck offers plenty of seating for family gatherings and a yard big enough for badminton in the summer and snow play in the winter. The lake is just a short walk away... and skiing at Homewood Ski Bowl is only a mile down the road. Homewood Mountain Resort offers great terrain, spectacular views of the lake and well-priced lift tickets!!! Alpine Ski Area and Squaw Valley are located about 20 minutes away. There are tons of other recreational activities available including a bike trail to Sugar Pine State Park and immediate access to the pristine Desolation Wilderness Area via the Rubicon Trail. If you are after more civilized pursuits, Chamberland's Beach, Restaurant and famous Pier-side Bar is just a 10 minute walk. Other great eating and drinking establishments are just minutes away too. The North Shore Casinos are 20 miles away and the South Shore Clubs are 25 miles south. Big Winter Vacation Plus: Unlike many Tahoe homes, Aspen Brook is located at lake level offering easy access on city streets that are always the first to be plowed. That means no steep streets, no unnecessary 'chaining up' and a 'stress-free' vacation. We are a family of four who live near the beach in Southern California, who enjoy all types of outdoor activities. In the Winter months we head to Tahoe as often as we can to enjoy skiing, shoe-shoeing, sledding (and getting cozy with a book or a good movie). In the summer months Lake Tahoe offers hiking, waterskiing, boating, rafting and biking. We love the West Shore feeling of the old "lazy days of summer", where things can be as slow, or as active as you want them to be. We wanted our cabin to be a place where families and friends gather to enjoy time together and make memories, and if you read our guest book with 17 years of entries...we are happy to say that the place has accomplished that, not only for our own family but many, many others who have visited. When we travel away from home, we like to go to places that feel different from our permanent home, but are clean, safe, cozy and comfortable too. When we found the Burt Anderson designed, old-Tahoe style cabin, we knew it was the place for us. Located on the West Shore, the area has charm, a relaxed vibe, access to endless outdoor activities with amazing backdrops, beaches, views and hiking trails. In some ways the cabin feels like a step back in time. With pecky cedar construction, stone fireplace, and cabin decor. The house sits on a corner lot with forrest land and creek on the other side and immediately behind, and feels private even though it is located in small quiet neighborhood. The kitchen and bathrooms have been updated for convenience but we tried to maintain the original rustic charm of the cabin. Being able to walk to the beach was a requirement for us, and to find Chamberlands beach with it's charming Dockside Bar and Grill on site was a huge bonus! Walking distance to the Lake, yet far enough from busy Highway 89 so there is no traffic noise. Street level access so there is no steep driveway to navigate in the snowy winter months. The yard is large for the area with room for outdoor play and relaxing. First floor only. Queen bedroom with adjacent bath. Cabin doors are more narrow than homes built today, so a small or travel chair is required. Everything was very organized and prepared. We knew where everything was, we will definitely be coming back as soon as possible! We love it. Our little family had a great time. Nice location very wheelchair friendly. We had a fantastic weekend with our kids. It was fantastic seeing them play in the open area while we made dinner or had our coffee by the window. Traditional cute cabin feel with nice details, comfortable with everything you need.Wonderful place! Wonderful cabin that had everything we needed. Love the comfortable beds, heated floors and decor. We are two seniors vacationing with our three adult children and we had a perfect week at this cabin. The beds were comfortable, the showers were good and the kitchen was very well equipped. We cooked breakfast every morning and dinner six of the seven nights and it was very easy. The gas grill is a good size and worked well. Linda was a very responsive host and was very helpful. I would only be concerned about renting this house with small children as the stairs between floors are very steep and narrow. Charming, relaxed, perfect for our family of 4. Outside the rush of town!